Francis Ford Coppola Winery in Sonoma County is a star of California winemaking. And Napa’s own Syar Industries is a star of Northern California road building and repair. So when the Coppola Winery called Syar to come and repair some problem potholes, Syar responded—and brought the star of quick, cost-effective pothole repair: EZ Street asphalt. There were three specific problem areas around the winery. The first was a birdbath. As you probably know, these pesky little dents in the road surface are relatively insignificant—unless they’re ignored, and the concavity increases in size, eventually turning into a full-blown pothole. All it takes is everyday wear & tear, and voila: your birdbath turns into a bathtub of a hole in the road. The Syar Industries crew merely had to sweep out the birdbath, pour the EZ Street product into the concavity, and compact it. No need to even drain the birdbath. EZ Street asphalt’s polymer-modified formulation displaces water—making it the perfect quick and easy birdbath repair. The next area was a much bigger challenge. This is a stop at the winery where tanker trucks are required discharge water in great quantities. The pavement there was a glorious mess, a very wet environment with lots of big potholes. Under normal circumstances, you might look at this project and say, “Time for hot mix and a roller.” Not so with EZ Street asphalt on the job. The crew from Syar cleared the loose debris out of the potholes. Then, they emptied bags of EZ Street asphalt into the holes and compacted it. Again, no need to empty the holes of water. 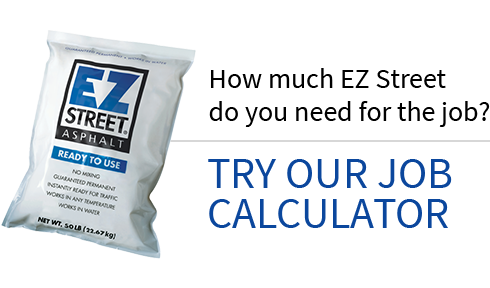 EZ Street asphalt displaces the water, making for a quick and easy repair of problem potholes. And the repairs are guaranteed permanent. They will outlast the surrounding pavement. The third pothole problem perhaps best illustrates why EZ Street asphalt is such a boon to road repair: in this case, the EZ Street product was being used to fix a previous square patch gone bad. The pavement surrounding the failed repair had alligatored in every direction. Loose pavement was coming out in several spots. Moving in with shovels, the Syar crew removed the loose asphalt, put the EZ Street product into the resulting hole, and compacted it. The resulting patch quickly repaired the worst of the area, and is guaranteed to outlast all of the surrounding pavement. The EZ Street patch will still have integrity when the area is repaved in the future. Getting hot mix to a remote rural location like this presents an obvious challenge. 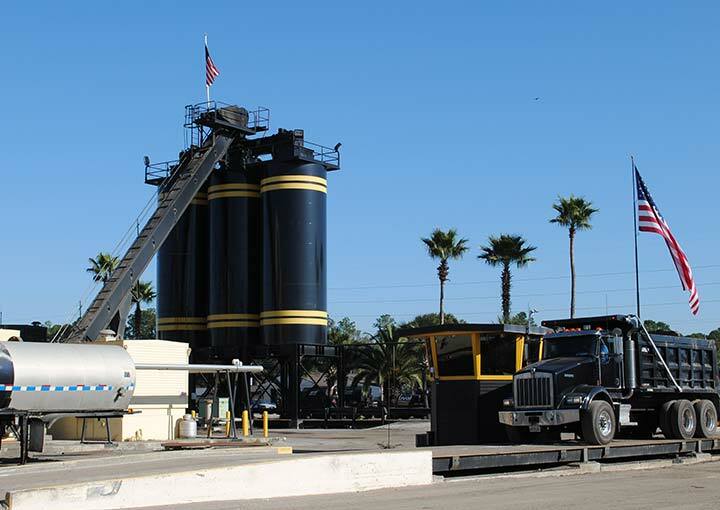 But using a small crew armed only with hand tools and a few bags of EZ Street cold asphalt, Syar Industries was able to make the drive, swoop in, repair things quickly, and cap the cost of the project. And the co-star in Syar’s picture for Coppola is EZ Street cold asphalt—out there showing potholes who’s boss.